Sonny James, the Southern Gentleman, used the popular Nashville sound of the '60s to countrify pop hits of the past into a form accessible to many, broadening country music's appeal across the nation. James even moved over to the pop charts for a time in the late '50s but found the secret of his success by the time he returned to country. During the late '60s, he scored an incredible five-year run of number one singles which locked up the top spot for a combined 45 weeks during the late '60s. Born James Loden on May 1, 1929, he began performing with his show-business family at the age of three and played with his four sisters as the Loden Family while in his teens. The group appeared around the South and on radio shows like the Louisiana Hayride and Saturday Night Shindig. After spending time overseas during the Korean War, Loden took Sonny James as his stage name -- after his teenage nickname. He met and played with Chet Atkins, who later got him a tryout with Capitol Records. The label liked what it heard and offered James a contract. His first single, "That's Me Without You," hit the country Top Ten in early 1953, but it was three years before "For Rent (One Empty Heart)" became his second big hit. James, who played guitar on virtually all of his records, followed up with two 1956 Top Ten near-misses "Twenty Feet of Muddy Water" and "The Cat Came Back." His next single became his biggest hit: "Young Love" spent nine weeks at number one during 1956-1957 and crossed over to top the pop charts also. Beginning in 1957, James began to focus his attention on the popular charts. "First Date, First Kiss, First Love" made the Top 25, but no follow-up placed as high. Several of his failures had still managed to go Top Ten on the country charts, so James returned to country with a vengeance in 1964. "You're the Only World I Know" hit number one country late that year and spent four weeks atop the chart. That began one of the greatest tears country music has ever known: 21 of his next 25 singles hit number one (and the other four near-misses hit either two or three). James completely dominated the chart from 1964 to 1972, though only several singles crossed over for modest placements on the popular charts. That fact is somewhat surprising, since three-quarters of James' number ones had previously been pop hits, including "Take Good Care of Her" for Adam Wade, "I'll Never Find Another You" and "A World of Our Own" for the Seekers, "Born to Be With You" for the Chordettes, and Roy Orbison's "Only the Lonely." Backed by his Southern Gentlemen band, James toured the country and overseas, appeared on The Ed Sullivan Show, Hee Haw, and The Bob Hope Show, and made several movies, including Las Vegas Hillbillies (1966), Second Fiddle to a Steel Guitar (1967), and Nashville Rebel (1967). Billboard named him the Number One Artist of 1969. Even after James' number one streak ended in January 1972, he continued to place high on the charts. The number two "Only Love Can Break a Heart" (a pop hit for Gene Pitney ten years earlier) was followed by the number ones "That's Why I Love You Like I Do" and -- after moving to Columbia in mid-1972 -- "When the Snow Is on the Roses." James' next chart-topping single, "Is It Wrong (For Loving You)," was released in March 1974, and it began his last major run. He followed with four consecutive Top Ten hits, "A Mi Esposa con Amor (To My Wife With Love)," "A Little Bit South of Saskatoon," "Little Band of Gold," and "What in the World's Come Over You." By the early '70s, James had moved into producing and music publishing also; he oversaw three of Marie Osmond's albums and still managed occasional Top 10 singles, himself. 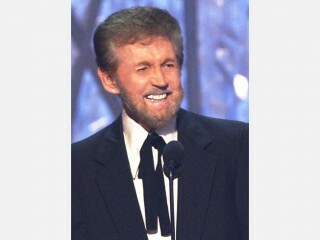 He picked up the prestigious award of Country Music's Male Artist of the Decade from Record World in 1977 and moved to the Monument label in 1979, then to Dimension two years later. He retired in 1983 and continues to reside in Nashville. View the full website biography of Sonny James.